Die roep, die ken je wel! Dit liedje werd vast veel gezongen bij de familie Groothoff. 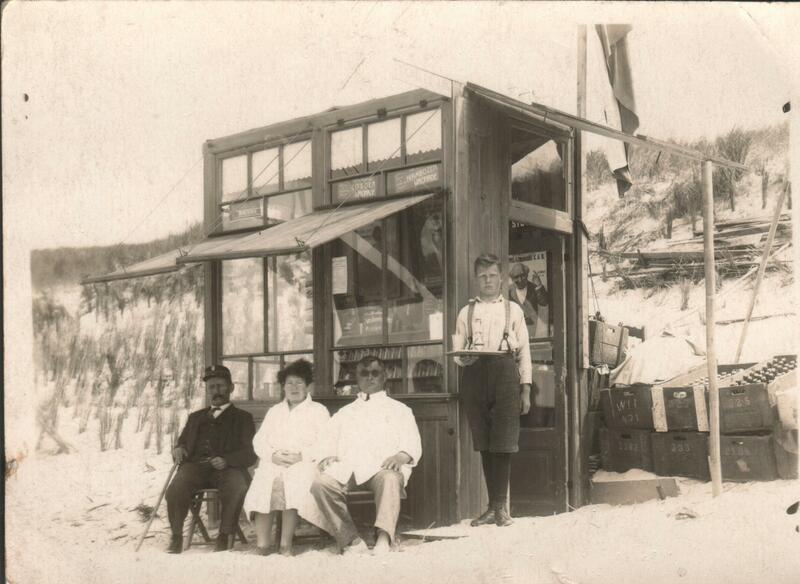 Willem Groothoff (1887-1925), banketbakker in Callantsoog en Schoorl, trok in de jaren ’20 met een ijskar door de omgeving. 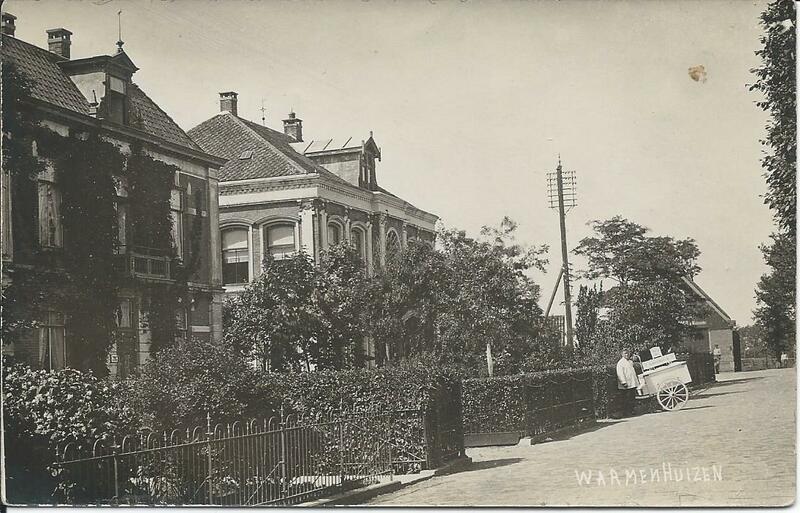 Op 11 en 12 augustus 1923 werd in Schoorl door de V.V.V. een zomerfeest georganiseerd met op zaterdag kinderspelen en ’s avonds bal. Op zondagmiddag was er een bloemencorso, waarbij diverse prijzen werden uitgedeeld voor de mooist versierde wagens, auto’s en rijwielen. Voor de kinderen waren er aparte prijzen. Willem Groothoff was erin geslaagd om voor zijn kinderen een mini-ijswagen te construeren; voor hen was een troostprijs weggelegd. In de zomer van 1925 overleed vader Willem onverwacht, slechts 38 jaar oud. Broer Harrie, 2 jaar jonger, ontfermde zich over het gezin met 3 jonge kinderen, echter niet geheel en al onbaatzuchtig. In 1925 of 1926 zien we Harrie in dezelfde business als Willem opduiken. Hier komen we hem tegen met een ijskar in Warmenhuizen. In februari 1926 verhuisde weduwe Groothoff met haar 3 kinderen naar Amsterdam en betrok de woning van Harrie aan de Bloemgracht. In dezelfde week liet Harrie zich uitschrijven en werd in maart inwoner van Schoorl. Het lijkt op een huizenruil. Niet veel later liet Harrie een eigen ijswagen bouwen; het was meer een kiosk dan een kar. 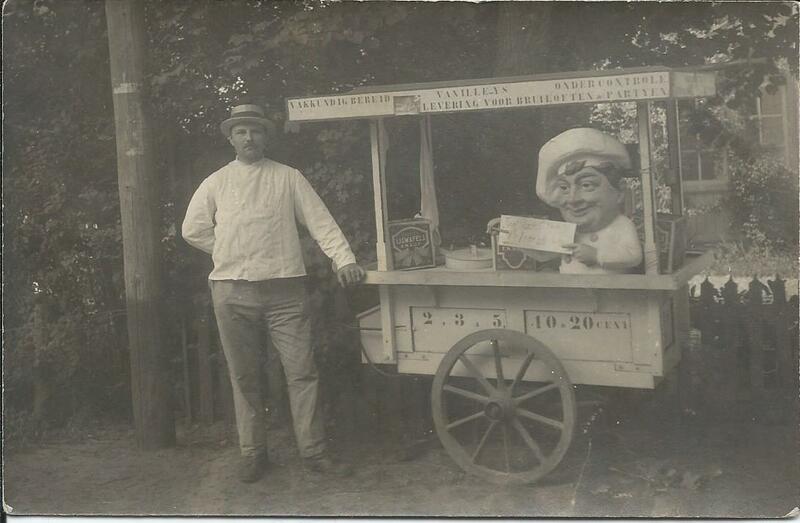 Is dit de kiosk, waarover in de gemeenteraad van Schoorl in februari 1927 gediscussieerd werd? Uit het verslag komt ook naar voren, dat Harrie zich flink heeft ingespannen voor het gezin van zijn broer Willem. Het kon echter niet zo zijn, dat hij daardoor een voorkeursbehandeling kon krijgen. Weer een paar jaar later zien we Harrie met een echte kiosk, maar nu óp het strand van Schoorl, bij Camperduin. Maar dat verhaal komt in een volgend blog. Harrie en Willem zijn zoons van Hendrik Groothoff en Hendrica Roelina Welp, en net als al hun broers en zusters geboren in Zaltbommel. Hendrik is de zoon van weer een Willem, de zoon van Mattheis. Zie Stamboom Mattheis. By J. Groothoff, late Captain in the Royal Packet Navigation Company*. It is a strange and wonderful experience for one who has commanded liners and spent thirty years at sea entirely “in steam” or in motor ships, to find himself suddenly a passenger in a windjammer. Let me add at once that my 83 days’ voyage from Copenhagen to Port Victoria, a small place in the Spencer Gulf, South Australia, proved a delightful venture. 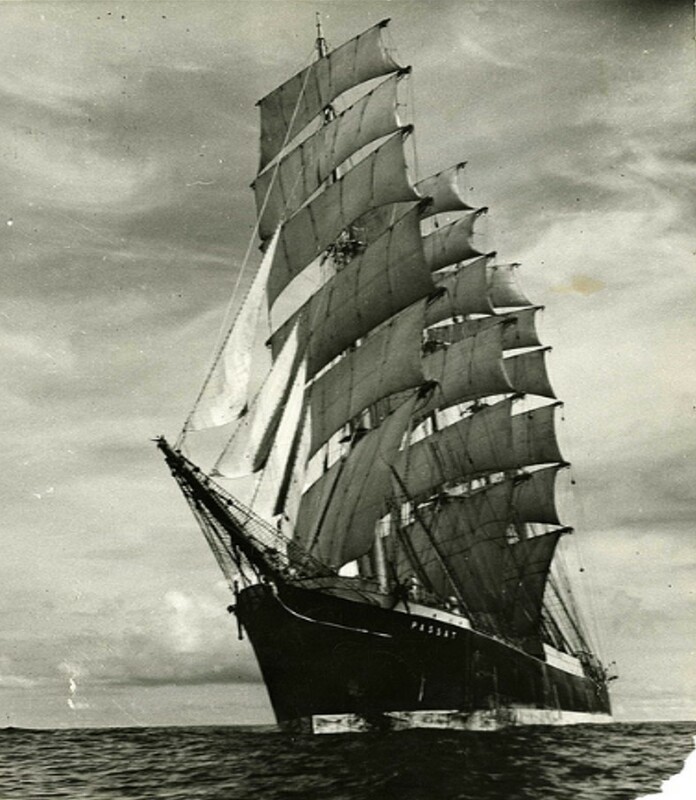 It was made in the four-masted Finnish bark “Passat”, a big ship as sailing ships go, for on her previous homeward trip she had loaded 5700 tons of wheat. In addition to a crew of twenty-eight, all told, she carried four passengers. These were most comfortably housed in good cabins, situate in the poop, and provided with their own smoking and dining rooms. The food, though simple and not such as the pampered passengers of a liner would have passed, was wholesome and good. Even the occasional hard ship’s biscuits seemed toothsome enough, since they brought back memories of one’s breezy apprentice days – thirty odd years ago – in the good old Soembawa, one of the stout cargo vessels of the ‘Nederland’ that have long since been scrapped and forgotten. Our first warning of what a passage in sail may entail came when we waited patiently for eight long days in the roads off Copenhagen for a favourable wind before we could as much as start. When we eventually did, however, the “Passat” presented a glorious sight as, with all her thirty-three sails set, she forged ahead at a steady twelve knots. The next events which brought home the difference between a power-propelled and a sail-driven ship occurred when we ran into adverse winds and gales in trying to make our passage round the north of Scotland. First, for two whole days, we tacked miserably up and down under four storm sails between the Orkneys and the Shetlands without making any headway against the westerly gales. No sooner had we made good our passage into the Atlantic, than we ran into the worst storm that we were to experience throughout the whole of this voyage. 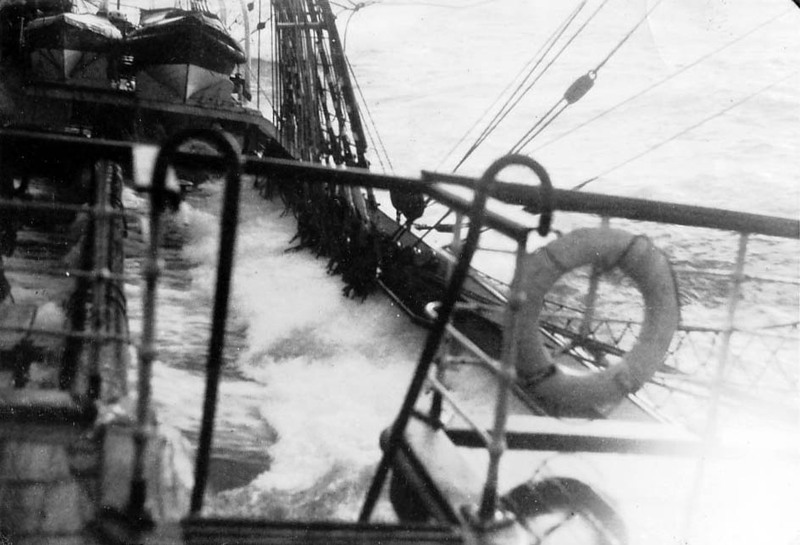 For three more days we tacked uncomfortably under two storm sails, one of which soon carried away, between the Faroes and the coast of Sutherland in the teeth of westerly gales which at times rose to hurricane force. The sensation was novel to a steamship skipper. When the commander of a power-driven liner runs into a gale, and seas starts breaking unpleasantly over his ship, all he has to do is to slacken speed, and if things get really bad, heave to and keep the vessel’s head on to the sweeping seas. Not so the master of a square-rigged sailing ship. He knows that his crew is never excessive, and in fact barely adequate to cope with a sudden emergency. He must, therefore, anticipate the event. In the leisurely days of the old East Indiamen sail was shortened every evening, that the night might be snugly spent. 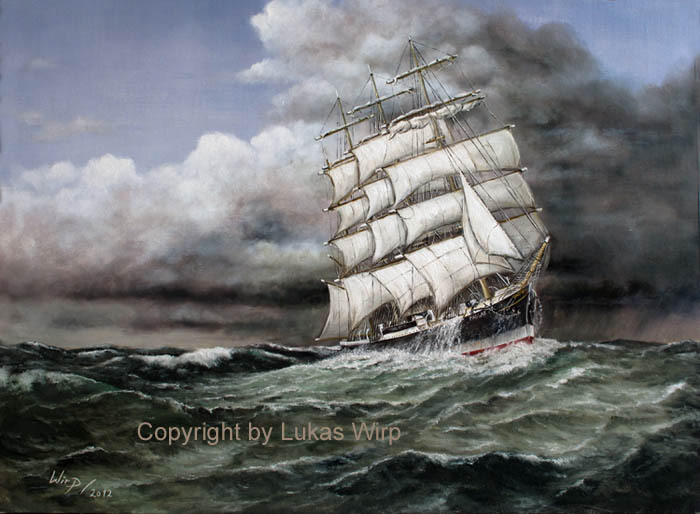 Since the days of the racing clippers no master would consider himself worthy of a good ship who did not keep as much canvas aloft up to the last moment as his ship could safely carry. Yet to furl huge sails when a gale has already gripped them, is for the eight men clinging to a yard always an arduous, at times insuperable task. The art of timing the shortening of sail with precision between the moment when it would come to soon, and that when it would be too late, is not the least among the attainments by which a sailing captain stands out among his peers. In accordance with usual practice the master of the ‘’Passat’ had at just the right moment reduced her sails to the fore staysail and three lower topsails which were as much as the masts were likely to stand. In fact soon even this canvas proved too much in the teeth of the rising gale, and two more topsails had only just been furled when, with a report like a gun shot, the third blew to ribbons. The salving of as much of this sail as was left proved an arduous task for the almost exhausted seamen. 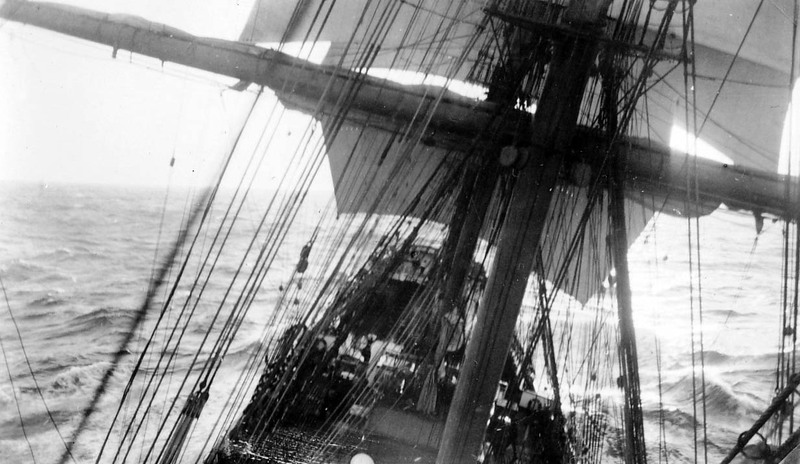 Under our sole remaining sail the ship was kept head on the mountainous seas that were driven before the gale which had grown into a full-blown hurricane. Here came another surprise. In a steamer riding out such weather the propellors would at frequent intervals have suddenly risen above the waves and, churning in air instead of water, would have sent a vibrant shudder throughout the length and breadth of the ship, while seas would have washed her decks from forecastle head to poop. Not so in this sailing ship. With steady, undulating movements she climbed one wave after another, or slid smoothly down into the troughs between them, shipping very little water and vibrating not at all. Most curious in fact was the stillness of the ship in the midst of this roaring sea when the wind was shrieking through the bare rigging. Even to this hardened mariner t seemed as if for the first time he saw the full beauty of the ocean when lashed by a gale. Our subsequent experience was on the whole of a more placid and pleasant kind. There were leisurely intervals of light winds, such as those which kept us four days within sight of the Canary Islands, without bringing us perceptibly nearer; and lazy times in the Doldrums when, as we lay becalmed and with listless sails, shark fishing proved the only excitement. Having crossed the Line and received Father Neptune with the appropriate ritual, we sailed pleasantly along until in latitude 23 degrees South the South East trade winds forsook us. For the next nine days we worked our way with variable breezes down to latitude thirty-three South where westerly winds began to favour our eastwards passage. Having crossed the meridian of the Cape of Good Hope in latitude forty-three, the strong westerly winds of the “Roaring Fortis” sped us briskly on our way. With the regularity of steam-driven ship we maintained a speed of elven to twelve knots, at times touching thirteen, with 318 miles as the best run for twenty-four hours. Then was the occasion to observe and enjoy this grand sailing vessel at her best, and passengers and crew grew equally elated. Not even a fairly severe storm at Christmas marred our good mood, and the festive day was celebrated in great style and the happiest spirit. All too soon for the liking of most of us we dropped anchor in the sheltered roadstead of Port Victoria, in the northern nook of Hardwicke Bay where, with regret and gratitude, we took leave of the able captain and the splendid officers and men of the good bark “Passat”. * The voyage was made in November, December 1934, January 1935. 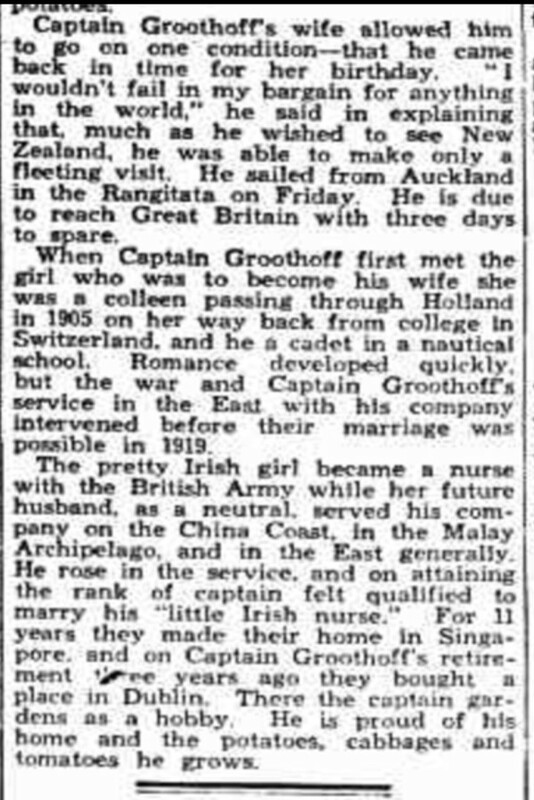 There is also an article about Johann Groothoff in The Telegraph (Brisbane, QLD), 4 Feb 1935. See “Sea captain’s vow”. Johann Groothoff was born in 1885 in Manggar, Dutch Indies. He was the second son in the family of Johann senior and Johanna Dorotheia Deinges. Johann senior died in 1894. The family remigrated to the Netherlands. Johann followed a marine career. In 1905 he became 3rd mate, graduated in Rotterdam. He served the Royal Packet Navigation Company since then. He became captain of a steamer in 1913. 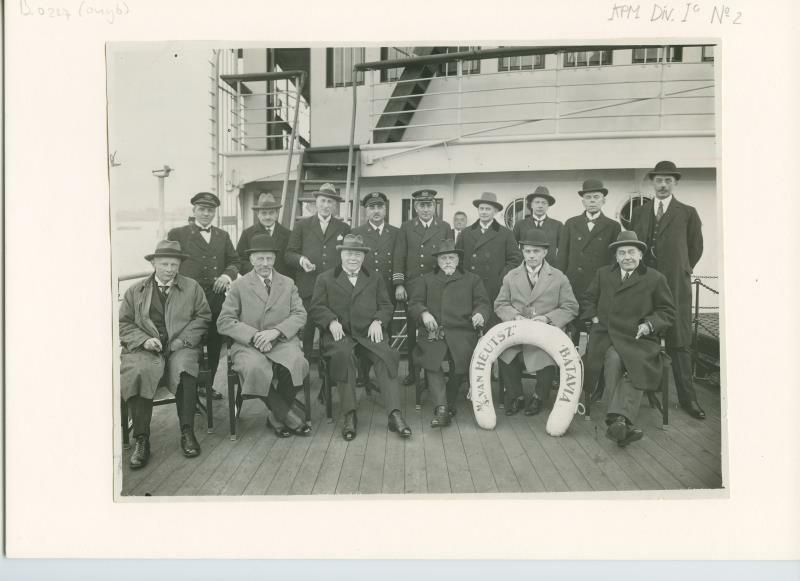 In 1926 he commanded the brand new motor ship the Van Heutsz. He retired in 1930 at an age of 45. He lived in Dublin, Ireland, till his death in 1964. See his story in Dutch. P.S. 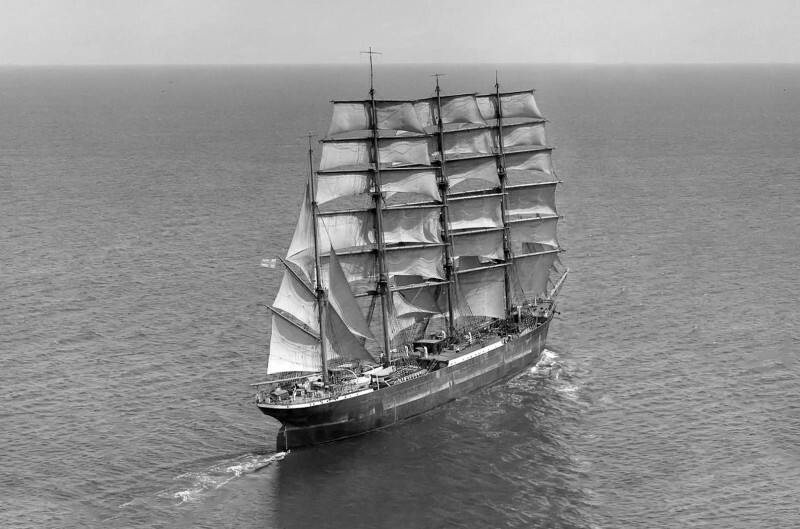 You can still visit this four-masted steel barque. The Passat is moored firmly on the Priwall shore in Lübeck-Travemünde. Official website. 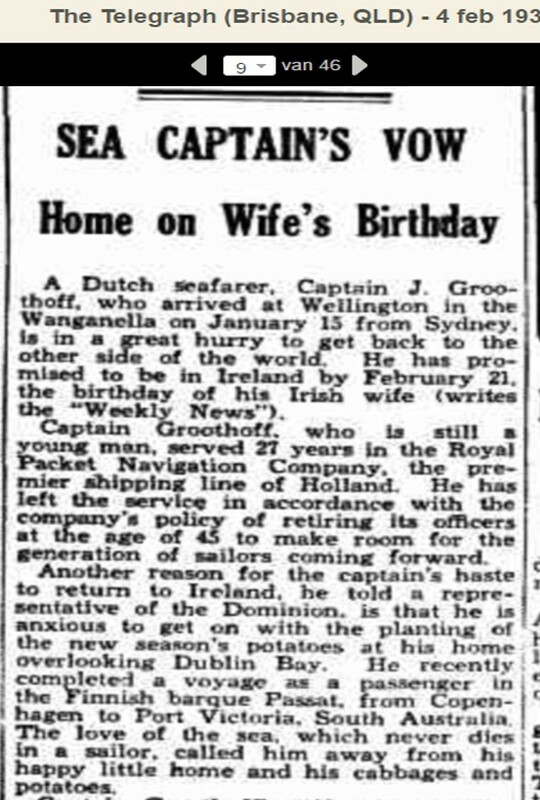 A Dutch seafarer, Captain J. Groothoff, who arrived at Wellington in the Wanganella on January 15 from Sydney is in a great hurry to get back to the other side of the world. He has promised to be in Ireland by February 21, the birthday if his Irish wife (writes the “Weekly news”). Captain Groothoff, who is still a young man, served 27 years in the Royal Packet Navigation Company, the premier shipping line of Holland. He has left the service in accordance with the company’s policy of retiring its officers at the age of 45 to make room for the generation of sailors coming forward. 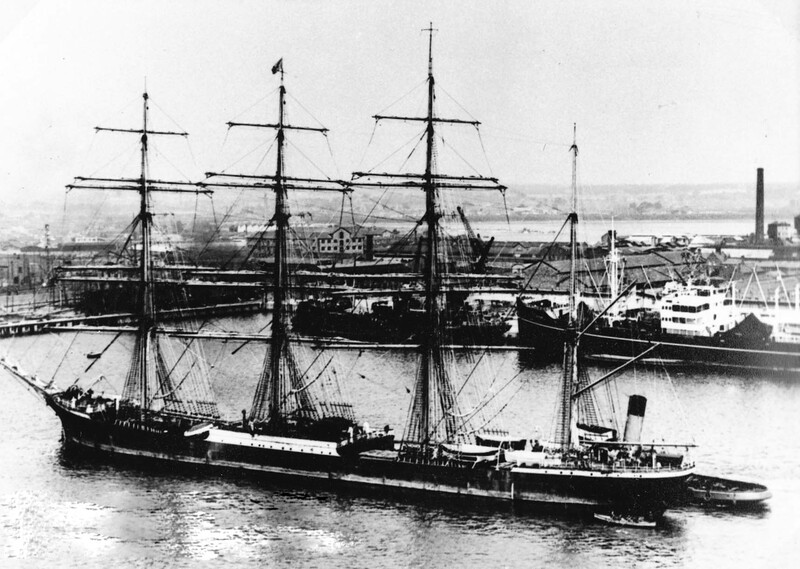 An other reason of the captains haste to return to Ireland, he told a representative of the Dominion, is that he is anxious to get on with the planting of the new season’s potatoes at his home overlooking Dublin Bay. He recently completed a voyage as a passenger in the Finnish barque Passat, from Copenhagen to Port Victoria, South Australia. The love of the sea, which never dies in a sailor, called him away from his happy little home and his cabbages and potatoes. Captain Groothoff’s wife allowed him to go on one condition – that he came back in time for her birthday. “I wouldn’t fail in my bargain for anything in the world”, he said in explaining that, much as he wished to see New Zealand, he was able to make only a fleeting visit. He sailed from Auckland in the Rangitata on Friday. He is due to reach Great Britain with three days to spare. 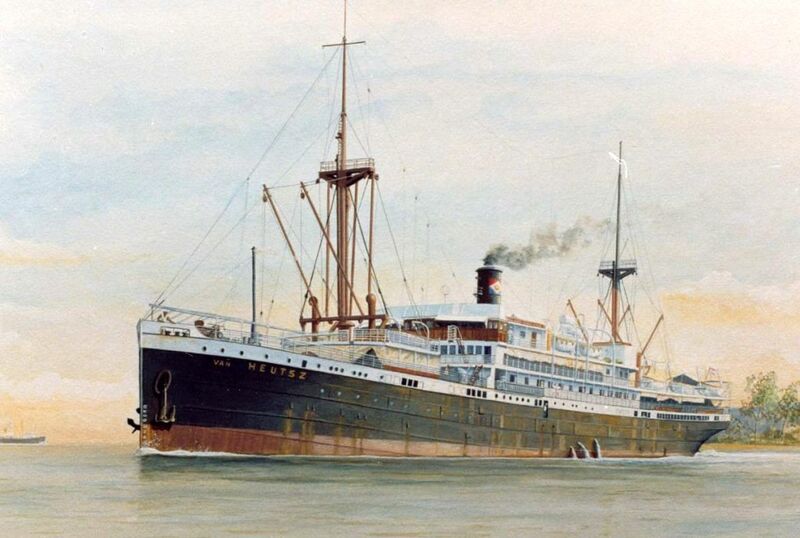 When Captain Groothoff first met the girl who was to become his wife she was a colleen passing through Holland in 1905 on her way back from college in Switzerland, and he a cadet in a nautical school. Romance developed quickly, but the war and Captain Groothoff’s service in the East with his company intervened before their marriage was possible in 1919. The pretty Irish girl became a nurse with the British Army while her future husband as a neutral served his company on the Cinese Coast in the Malay Archipelago and in the East generally. He rose in the service and on attaining the rank of captain felt qualified to marry his ”little Irish nurse”. For 11 years they made their home in Singapore, and on Captain Groothoff’s retirement three years ago they bought a place in Dublin. There the captain gardens as a hobby. He is proud of his home and the potatoes, cabbages and tomatoes he grows. Met een gestage vaart ploegt de Van Heutsz door de golven van de Chinese zee. De zon schijnt onbarmhartig op het bovendek, een briesje brengt wat verkoeling. Tussendeks, waar zo’n 2000 Chinese koelies bivakkeren, is het een kabaal van jewelste, het Kantonees klatert onnavolgbaar, kinderen jengelen. De lucht van scherpe kruiden, aangebrande vis, en vooral de rook van de walmende oliestelletjes is nauwelijks te harden. Toch is het een vrolijke boel, de koelies hebben hun seizoenarbeid er op zitten en reizen met de Van Heutsz richting Hong Kong, huiswaarts. Opeens valt er een stilte in de bedompte ruimte. Een voorname man in spierwit uniform klimt de scheepstrap af: de kapitein in het gezelschap van een van zijn onderofficieren inspecteert het schip, een cameraman loopt mee. Het is een van de laatste reizen van kapitein Johann Groothoff. In november wordt hij 45 jaar en kan dan van de Koninklijke Paketvaart Maatschappij (K.P.M.) met pensioen. Vanaf 1905 heeft hij bij de K.P.M. 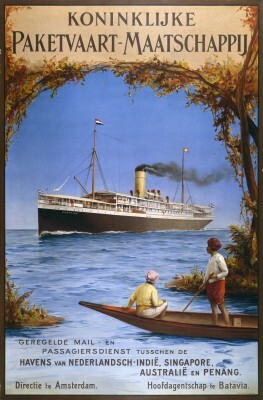 gevaren, vanaf 1913 als kapitein; hij kent de Indische wateren op zijn duimpje. De K.P.M. onderhoudt al vanaf 1891 verbindingen tussen de Indische eilanden. “Iederen dag dien Ge wilt, doorploegen tientallen van haar schepen de blauwe zeeën van Indië, niet slechts ladingen vervoerend, maar ook reizigers, tot in de verste uithoeken van den archipel. Reizen met de K.P.M. doet een ieder, die zich tusschen de eilanden verplaatsen wil en hare schepen wegens dienstregeling en comfort verkiest boven de inheemsche prauwen en Chineesche of andere stoom- en motorboten”. Aldus een ronkende zin uit het boek Een halve eeuw Paketvaart, 1891-1941. Groothoff begon als gezagvoerder op een aantal stoomschepen, zoals De Eerens en de Van der Capelle *. In 1926 mag hij in Vlissingen bij de werf de Schelde de proefvaart van het motorschip de Van Heutsz begeleiden. Trots staat hij te midden van het voltallig bestuur van de K.P.M. op het dek. Tot aan zijn pensionering is hij de captain aan boord. De Van Heutsz onderhoudt de vaste verbinding tussen Singapore en Hong Kong op de Deli-Straits-China lijn. De Van Heutsz is een passagiers/vrachtschip, ruim 118 meter lang, bijna 16 meter breed; het schip telt een bruto tonnage van 4588. Het maximale vermogen bedraagt 2 X 1700 APK, waardoor het schip een snelheid kan bereiken van 12 mijl per uur. Op de Van Heutsz is plek voor 16 passagiers eerste klas, 30 tweede klas, 24 derde klas en 2173 passagiers tussendeks! De Eerens, het eerste schip waarop hij gezagvoerder was, een stoomschip, telde een tonnage van 1050, was 70 meter lang en kon 630 passagiers vervoeren. Als kapitein heeft hij heel wat te stellen met de passagiers; herhaaldelijk vindt er op de Van Heutsz een opiumaanhaling, een inbeslagname, plaats. En notabene op zijn laatste vaart in december 1930 heeft hij een ‘aanvaring’ met de hoofdagent, die als vaste bewaker met zijn manschappen de koelies begeleidt. In meer dan 10 kranten is het verslag te lezen van de Muiterij op de Van Heutsz. Deze zaak-Tüllmann zal ik later nog eens uitwerken. Johann Groothoff wordt geboren op 25 november 1885 in Mangar op Billiton, waar zijn vader Johann hoofdadministrateur is bij de Billiton Maatschappij, een mijnbouwbedrijf dat op het eiland Billiton (Belitung) tinmijnen exploiteerde. Johann Junior is het 2e kind in het gezin van Johann Groothoff en Johanna Dorothea Deinges. De oudste is Arnold, hij wordt ingenieur; het 3e kind Christiaan Theodoor wordt ingenieur/geoloog en brengt het tot directeur van de Staatsmijnen. Betsy, Jacoba Elisabeth, het 4e kind, treedt een tijdje op als toneelspeelster en is later apothekersassistente. Pas 2 weken na de geboorte van dit 4e kind in 1892 treden de ouders in het huwelijk. Was hier sprake van een concubinaat, het samenleven van een Europese man met een inlandse vrouw, in deze relatie iemand met Chinees bloed? Vader Johann (geboren in Zaltbommel 1856, zoon van Arnold, zoon van Johannis) had blijkbaar een zwak gestel. Hij ging een aantal keren om gezondheidsredenen terug naar Nederland. Hij werkte vanaf 1881 als administrateur voor Billiton en was in 1892 benoemd tot hoofdadministrateur. Hij had al wel ervaring in de tropen. Zijn diensttijd bracht hij door in Nederlands-Indië. Uit zijn brieven uit Atjeh, waar hij diende, leren we hem kennen als een gevoelige jongeman. Bij zijn kinderen is er minder ruimte voor gevoeligheid. Een verklaring zou kunnen zijn dat zij op jonge leeftijd ‘wees’ werden. Het gezinsleven is in 1894 wreed verstoord als vader Johann overlijdt in het militair hospitaal in Weltevreden, bij Batavia. Arnold is 11, Johann jr 8, Christiaan 7 en Betsy 2 jaar oud. We vinden het gezin niet veel later terug in Gouda in het ‘koude’ Nederland, kijk maar naar de foto van Arnold en Johann met schaatsjes. In Gouda woonde toen oma Groothoff – van Roggen. Moeder Johanna is niet in staat de kinderen op te voeden, zij is regelmatig niet aanspreekbaar, niet voor rede vatbaar. Is zij chronisch depressief? In 1908 wordt oom Christiaan Jan benoemd tot voogd over de minderjarige Betsy. Bij de huwelijken van Arnold en Christiaan Thedoor, in 1909 en 1911, moet de kantonrechter er aan te pas te komen, omdat moeder geen toestemming voor het huwelijk wil of kan geven. Op 2-12-1913 overlijdt moeder Johanna Dorotheia Deinges in het Krankzinnigengesticht in Batavia, waarheen ze kort daarvoor was teruggekeerd. Na zijn middelbare school gaat onze Johann naar de Zeevaartschool. Eerst dient hij waarschijnlijk bij de Koninklijke Marine. In 1905 haalt hij in Rotterdam het examen 3e stuurman en gaat varen bij de K.P.M. Eind 1910 slaagt hij in Batavia voor het examen 1e stuurman grote stoomvaart. 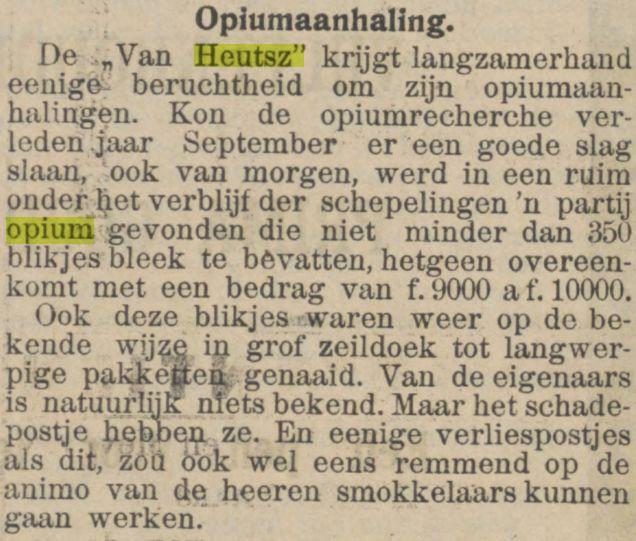 In de zomer van 1905 is hij aan het passagieren in Rotterdam. 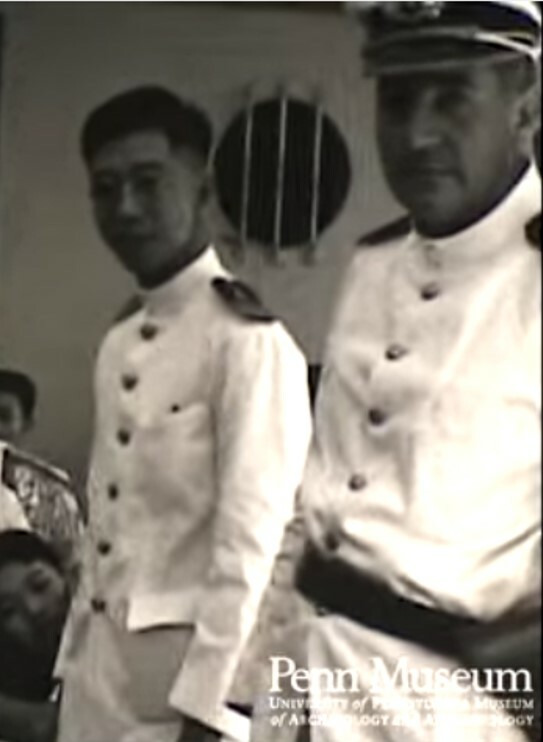 De jonge stuurlieden trekken in hun knappe uniformen de aandacht van een groep buitenlandse meisjes, die onderweg zijn van hun kostschool in Zwitserland naar Groot-Brittannië. De ontmoeting met de Ierse Dorothy Stuttard leidt tot een jarenlange correspondentie; zij hebben trouwplannen als Johann kapitein is geworden. De Eerste Wereldoorlog gooit roet in het eten, pas in 1919 is er tijd en gelegenheid voor een huwelijk. Johann en Dorothy vestigen zich in Singapore, waar Johann zich met tussenpozen meldt. 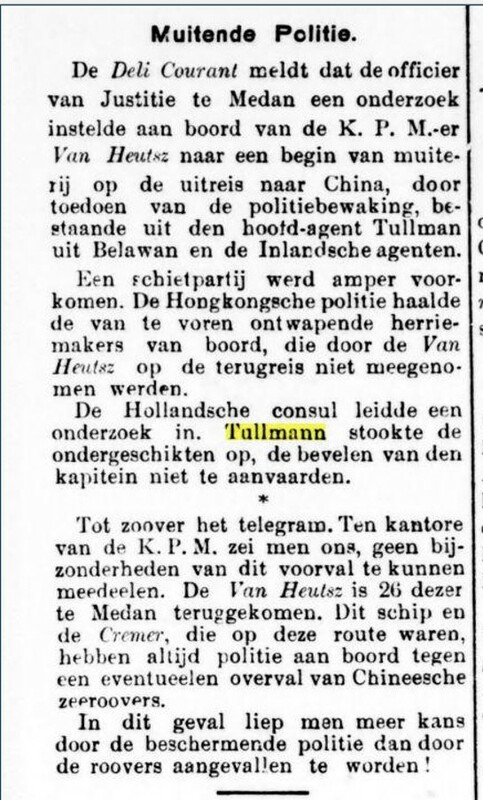 Vanaf 1926 komt er meer regelmaat in de relatie als hij een vaste route vaart tussen Singapore en Hong Kong. Na zijn pensionering in 1931 vestigt het echtpaar zich in Dublin. De zee blijft echter aan Johann trekken. Vanuit zijn huis aan de baai van Dublin ziet hij schepen in- en uitvaren. Vooral de prachtige klippers in volle zeilen trekken zijn aandacht. Een van die schepen is de viermaster de Passat. In 1934 vaart onze scheepskapitein mee als passagier op de Passat, van Kopenhagen naar Port Victoria aan de zuidkust van Australië, een tocht van 83 dagen. Maar dat is een ander verhaal. * Hij was gezagvoerder op De Eerens, Van der Capellen, Van Overstraten, ’s Jacob, Reijniersz, Sembilan, Bengkalis, Van Rees, Sibolga, Singkawang en de Van Heutsz. Het huwelijk van Mattheis en Jenneke in 1805, zie het vorige blog, is een bewogen moment in hun leven. Als we het gezin in Zaltbommel volgen zien we dat er verder weinig opmerkelijke feiten zijn opgetekend. Na zoon Mathijs Arnold, roepnaam Arnoldus, worden nog 6 kinderen geboren, totaal 4 jongens en 3 meisjes. Een sterk geslacht, want alle 7 kinderen worden volwassen. Zoon Jan overlijdt als hij 23 is, de anderen bereiken een hoge leeftijd, respectievelijk 68, 73, 76 (2x) en 82 (2x) jaar. Hier alle gegevens op een rij. De Groothoffen vormen een hechte clan in Zaltbommel; bij huwelijken en overlijden zijn ooms en neven over en weer getuige. Mattheis kom je echter niet tegen als getuige, hij kon niet schrijven. Bij de geboorte van Jan in 1811, Franse tijd, wordt bij de ‘burgerlijke stand’ opgetekend “… les deux témoins ci dessus dénommés ont signé avec moi, le père de l’enfant sachant ne pas écrire”. […de twee getuigen, hieronder vermeld, hebben met mij, vader van het kind, niet kunnende schrijven, ondertekend]. Als je het niet wist, haal je hier geen M. Groothoff uit. Bij het huwelijk van deze Willem in 1850 ontbreekt de handtekening van vader Mattheis. Het gezin woont aan de Oude Vismarkt, vlakbij de Gasthuistoren. Hier links was het woonhuis en waarschijnlijk ook de slachterij. In de 19e eeuw was het heel normaal als er koeien door de stad liepen. Op de plattegrond gaat het om perceel 569, in de ‘U’; broer Hendrik woonde op perceel 204, rechtsboven, aan de Gasthuisstraat, hoek Kerkstraat. Mattheis is ‘boucher’, vleeshouwer, spekslager en landbouwer. Twee zoons worden ook landbouwer. In 1849, 70 jaar oud, is hij nog actief als slager, maar komt negatief in de krant: bij de stadspoort wordt ene Philip van Dijk aangehouden met een kruiwagen vlees, bestemd voor slager Groothoff. Probeerden ze illegaal vlees te slachten? In die tijd werden er plaatselijk ‘opcenten’ (belasting/accijns) geheven op de eerste levensbehoeften. Dus het was interessant om buiten de markt om te handelen. Andere blijken van zijn aanwezigheid in Zaltbommel zijn schaars. Mattheis komt voor in het register van notaris Van Dieden in verband met aan- en verkoop van enkele bunders land. Ook vraagt hij vergunning om een plankier over de straatgoot te leggen vanwege een verbouwing. Wat kun je vertellen over een persoon, waarvan geen afbeeldingen of beschrijvingen bestaan? Vanaf de 19e eeuw worden alle mannen in het Koninkrijk der Nederlanden gekeurd voor de militaire dienst, zo ook de zonen van Mattheis. Ze zijn alle 4 tussen 1.62 en 1.68 lang. Is dat groot of klein? Vergelijk je dat met de keuringen van de neven uit die tijd, dan zijn die allemaal langer, in de 170 tot 1 meter 82 aan toe. Mattheis is misschien 1 meter 65, gedrongen, stevig gebouwd, bruin haar, bruine ogen. Handen als kolenschoppen of liever als van een vleeshouwer? Handen zoals zijn kleinzoon Hendrik of zijn achter-achterkleinzoon Christiaan (mijn vader)? En ook een snor, zoals zij? Mattheis overlijdt in Zaltbommel op 16 juni 1869 op 89-jarige leeftijd; in de akte staat dat hij 90 is geworden, maar die leeftijd zou hij pas een maand later op 19 juli bereiken. Twee neven staan onder de overlijdensakte, de broers Christiaan en Arnold Groothoff. Matthijs was in ieder geval de oudste Groothoff in de 19e eeuw in Zaltbommel. Pas in 2010 is er een achter-achterkleinkind, bovengenoemde Christiaan, die echt 90 jaar wordt. Het huwelijk van Mattheis en Jenneke duurt tot 16 september 1846 als Jenneke overlijdt. Veel kinderen van de 2e generatie Groothoffen bleven ongehuwd en tot op hoge leeftijd bij elkaar wonen. Is hier sprake van een gebrekkige inburgering? Alleen zoon Willem trouwt en sticht een gezin. I.1 Mattheis GROOTHOFF M1, boucher (1810), vleeshouwer, spekslager, landbouwer, geboren op 19‑07‑1779 te Duisburg, gedoopt op 22‑07‑1779 te Duisburg, overleden op 16‑06‑1869 te Zaltbommel op 89-jarige leeftijd. 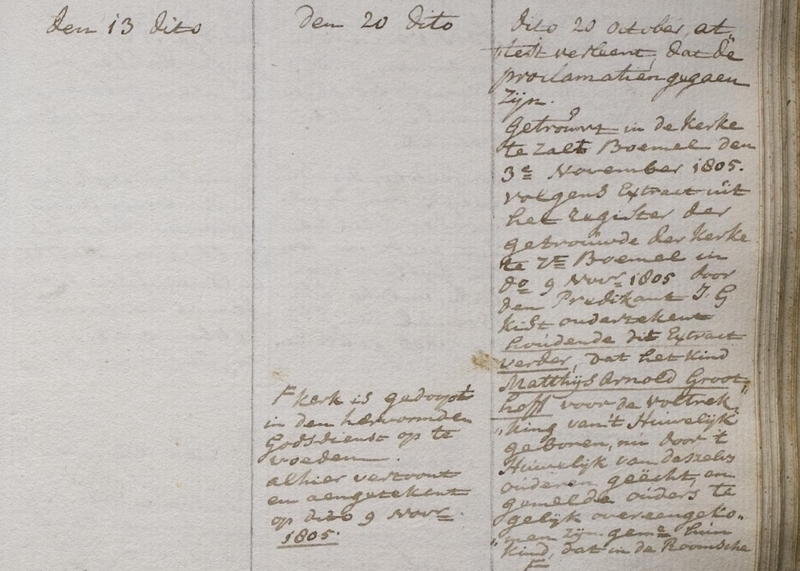 Gehuwd op 26-jarige leeftijd op 05‑10‑1805 te Zaltbommel, gehuwd voor de kerk op 03‑11‑1805 te Zaltbommel met Johanna (Jenneke) FRANCEN, 29 jaar oud, gedoopt op 21‑02‑1776 te Horssen, overleden op 16‑09‑1846 te Zaltbommel op 70-jarige leeftijd, dochter van Joannis FRANCEN en Joanna SCHALK. Het echtpaar moet bij het kerkelijk huwelijk beloven hun kind Mattheis Arnold (geb. 07-05-1805), hoewel Roomsch-Katholiek gedoopt, Hervormd op te voeden. 1. Matthijs Arnold (Arnoldus) GROOTHOFF M2, landbouwer, geboren op 07‑05‑1805 te Zaltbommel, overleden op 25‑10‑1881 te Zaltbommel op 76-jarige leeftijd, getuigen zijn neven Arnold en Christiaan, zonen van Johannis; Matthijs Arnold was ongehuwd. 2. Johannis GROOTHOFF M2, landbouwer, geboren op 10‑02‑1807 te Zaltbommel(EP), gedoopt op 19‑02‑1807 te Zaltbommel, overleden op 26‑12‑1883 te Zaltbommel op 76-jarige leeftijd. 3. Anna Catharina Geertruy (Geertruij) GROOTHOFF M2, dienstbode, geboren op 14‑08‑1808 te Zaltbommel(EP), gedoopt op 18‑08‑1808 te Zaltbommel, overleden op 25‑02‑1882 te Zaltbommel op 73-jarige leeftijd, getuige is neef Arnold, zoon van Johannis;. 4. Jan GROOTHOFF M2, geboren op 31‑01‑1811 te Zaltbommel, overleden op 04‑08‑1834 te Zaltbommel op 23-jarige leeftijd, getuige is oom Willem, vader van het gasthuis, oud 64 jaar;. 5. Antje GROOTHOFF M2, geboren op 16‑06‑1813 te Zaltbommel, overleden op 18‑01‑1882 te Zaltbommel op 68-jarige leeftijd, getuigen zijn neven Arnold en Christiaan, zonen van Johannis; . 6. Willem GROOTHOFF M2 (zie II.6). 7. Johanna Catharina GROOTHOFF M2, zonder beroep, geboren op 12‑07‑1818 te Zaltbommel, overleden op 29‑05‑1901 te Zaltbommel op 82-jarige leeftijd. II.6 Willem GROOTHOFF M2, landbouwer, geboren op 01‑10‑1816 te Zaltbommel, overleden op 01‑03‑1899 te Zaltbommel op 82-jarige leeftijd, getuigen bij overlijden zoon Hendrik, 42 jr. koopman, en schoonzoon Gerardus Martinus Woerlee, 37 jr.
Gehuwd op 33-jarige leeftijd op 14‑02‑1850 te Zaltbommel, getuigen bij het huwelijk zijn oom Hendrik, 77 jr. en broer Johannis, 43 jr., landbouwer, met Maria Magrieta van WEELDE, 27 jaar oud, geboren op 27‑07‑1822 te Ophemert, overleden op 04‑03‑1910 te Zaltbommel op 87-jarige leeftijd, dochter van Hendrik van WEELDE, arbeider, dagloner, en Jantje (Janske) van GELDER. 1. 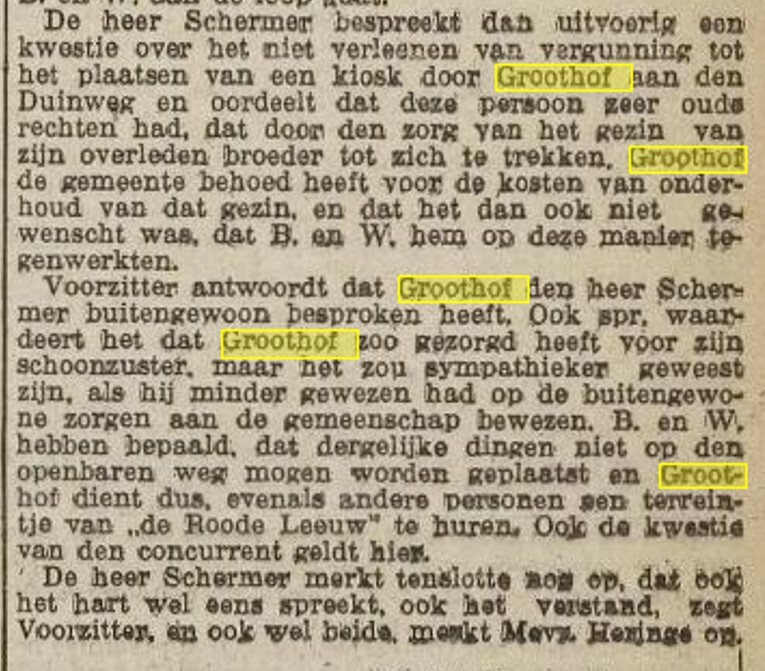 Jenneke GROOTHOFF M3, geboren op 25‑07‑1851 te Zaltbommel, overleden op 10‑03‑1923 te Zaltbommel op 71-jarige leeftijd. Gehuwd op 32-jarige leeftijd op 08‑05‑1884 te Zaltbommel met Coenraad Jan van VOORTHUIZEN. 2. Janske GROOTHOFF M3, geboren op 16‑01‑1853 te Zaltbommel, overleden op 04‑07‑1926 te Zaltbommel op 73-jarige leeftijd. 3. Matthijs GROOTHOFF M3, geboren op 02‑11‑1854 te Zaltbommel, overleden op 24‑05‑1916 te Zaltbommel op 61-jarige leeftijd. 4. Hendrik GROOTHOFF M3, huisknecht, koopman (1899), kruidenier, geboren op 14‑02‑1857 te Zaltbommel, overleden op 14‑01‑1945 te Amsterdam op 87-jarige leeftijd. Gehuwd op 27-jarige leeftijd op 04‑09‑1884 te Zaltbommel met Hendrica Roelina WELP, 30 jaar oud, dienstbode, geboren op 18‑05‑1854 te Winschoten, overleden op 06‑11‑1927 te Amsterdam op 73-jarige leeftijd, dochter van Heije WELP, wagenmaker, rijtuigmaker te Groningen en Winschoten, fabrikant in lak (1884), winkelier, en Roelina SMIT, dienstmeid. 5. Anna Catharina Geertruy GROOTHOFF M3, geboren op 14‑01‑1859 te Zaltbommel, overleden op 26‑11‑1912 te Zaltbommel op 53-jarige leeftijd. Hendrik GROOTHOFF M3, huisknecht, koopman (1899), kruidenier, geboren op 14‑02‑1857 te Zaltbommel, overleden op 14‑01‑1945 te Amsterdam op 87-jarige leeftijd. Roelina Maria Margrieta (Lien) GROOTHOFF M4, geboren op 07‑11‑1884 te Zaltbommel, overleden op 16‑05‑1968 te Amsterdam op 83-jarige leeftijd. Willem Haeye Hendrik GROOTHOFF M4, geboren op 16‑01‑1886 te Zaltbommel, overleden op 22‑07‑1886 te Zaltbommel, 187 dagen oud. Willem Haeye Hendrik GROOTHOFF M4, (banket)bakker, geboren op 11‑01‑1887 te Zaltbommel, overleden op 07‑06‑1925 te Alkmaar op 38-jarige leeftijd. Gehuwd op 29-jarige leeftijd op 14‑10‑1916 te Callantsoog met Grietje VOS, 32 jaar oud, naaister, geboren op 13‑02‑1884 te Callantsoog, overleden op 19‑03‑1950 te Zijpe op 66-jarige leeftijd, dochter van Jacob VOS, landbouwer, en Grietje LOUW. Christiaan Hendrik Frederik GROOTHOFF M4, behanger (1911), stoffeerder, woninginrichter, geboren op 30‑01‑1888 te Zaltbommel, overleden op 11‑01‑1943 te Amsterdam op 54-jarige leeftijd. Gehuwd op 25-jarige leeftijd op 27‑02‑1913 te Amsterdam met Anna Johanna Margaretha STROO CLOECK, 29 jaar oud, geboren op 09‑11‑1883 te Haarlem, overleden op 22‑04‑1951 te Amsterdam op 67-jarige leeftijd, dochter van Volkert STROO CLOECK, broodbakker, en Carolina Wilhelmina Ferdinandina ASSES. 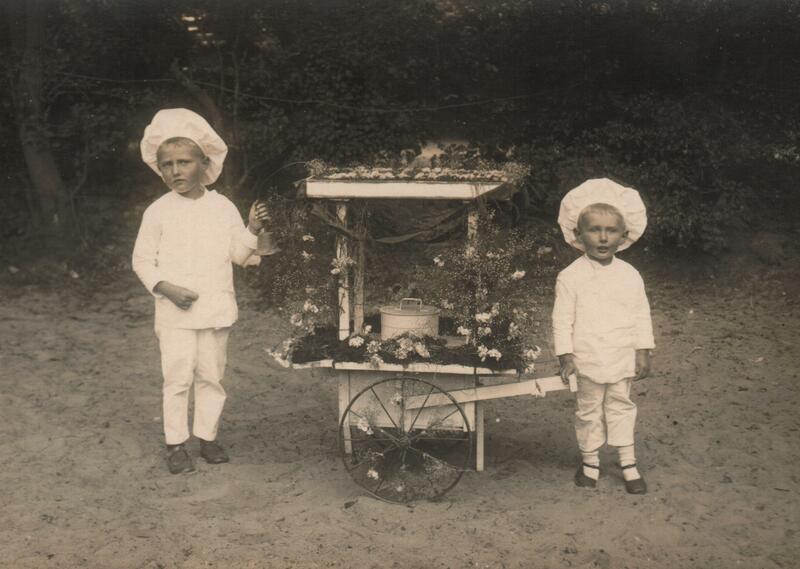 Heije Roelof Jan (Harrie) GROOTHOFF M4, slager (1913), ijscoman, koopman (1932), strandpachter, ,strandexploitant, café/restauranthouder, geboren op 08‑02‑1889 te Zaltbommel, overleden op 10‑11‑1956 te Amsterdam op 67-jarige leeftijd. Gehuwd (1) op 27-jarige leeftijd op 09‑03‑1916 te Amsterdam, gescheiden na 9 jaar op 06‑04‑1925 te Amsterdam van Hendrica Petronella Huberta (Rieka) VIALLE, geboren op 09‑01‑1885 te Zesgehuchten, overleden op 16‑12‑1982 te Amsterdam op 97-jarige leeftijd, dochter van Cornelis VIALLE en Petronella Maria Huberta VERHEIJEN. 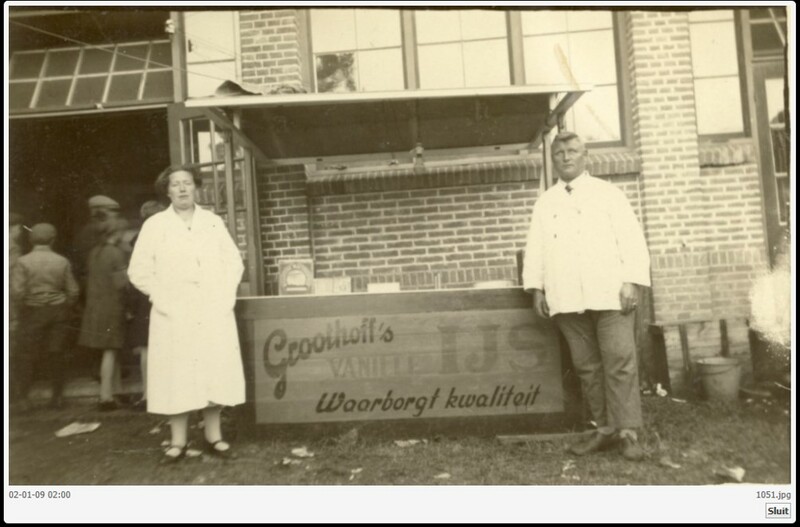 Gehuwd (2) op 43-jarige leeftijd op 19‑05‑1932 te Schoorl met Maria Cornelia Geertruida (Marie) LEGRO, 34 jaar oud, geboren op 19‑11‑1897 te Groenlo, overleden op 11‑05‑1956 te Alkmaar op 58-jarige leeftijd, dochter van Marie Antonie Jean Pierre LEGRO, klerk, en Berendina Johanna van WAASSEN. Marie Marinus Hendrikus GROOTHOFF M4, geboren op 01‑03‑1890 te Zaltbommel, overleden op 19‑06‑1928 op 38-jarige leeftijd. Gehuwd op 23-jarige leeftijd op 24‑12‑1913 te Amsterdam met Petronella WITTENBERG, 30 jaar oud, werkster, geboren op 03‑11‑1883 te Arnhem, overleden op 13‑06‑1963 te Amsterdam op 79-jarige leeftijd, dochter van Gerrit Jan WITTENBERG en Keetje SCHAAP. Maria Margrietha Roelina GROOTHOFF M4, geboren op 08‑04‑1891 te Zaltbommel, overleden op 08‑11‑1891 te Zaltbommel, 214 dagen oud. Maria Margrietha Roelina GROOTHOFF M4, geboren op 26‑06‑1892 te Zaltbommel, overleden op 14‑09‑1892 te Zaltbommel, 80 dagen oud. Maria Margrietha Roelina GROOTHOFF M4, geboren op 12‑12‑1893 te Zaltbommel, overleden op 14‑01‑1933 te Amsterdam op 39-jarige leeftijd. Gehuwd op 38-jarige leeftijd op 24‑12‑1931 te Amsterdam met Arjan (Arie) van der SPOEL, 34 jaar oud, zandschipper, geboren op 27‑05‑1897 te Bolsward, overleden op 10‑03‑1947 te Zaandam op 49-jarige leeftijd, zoon van Gabriël van der SPOEL en Dieuwke BIJLSMA. Hendrika GROOTHOFF M4, geboren op 28‑10‑1894 te Zaltbommel, overleden op 28‑10‑1894 te Zaltbommel, 0 dagen oud. Hendrik GROOTHOFF M4, banketbakker (Oosterparkstraat), geboren op 17‑08‑1896 te Zaltbommel, overleden op 22‑11‑1968 op 72-jarige leeftijd. Gehuwd op 29-jarige leeftijd op 22‑04‑1926 te Amsterdam met Cornelia Johanna HELLER, 30 jaar oud, geboren op 23‑08‑1895 te Amsterdam, overleden op 07‑06‑1990 te Amsterdam op 94-jarige leeftijd, dochter van Johan Herman HELLER en Catharina Jacoba SALON. Dem Arnold Groothoff einem Taglöhner allhier in Öderich ist von seiner Ehefrau Gertr. Eferts de 19 Julii 1779 ein Söhnlein gebohren und desselbe de 22. Id getauft und gennent worden Mattheis. Beij dem Prediger Kraft im Hause. De schrijfwijze Mattheis wordt later niet meer gebruikt, toch wil ik er aan vasthouden, het is tenslotte zijn doopnaam. Mattheis is de 5e zoon in het gezin, in 1783 wordt er nog een zusje geboren. Het is echter een droevig jaar, eerst overlijdt de oudste zoon Gerhard, 16 jaar oud, dan sterft moeder Gertrud in het kraambed en ook overlijdt het pasgeboren zusje, twee dagen jong. Vader Arnold hertrouwt in 1785 en er worden nog 2 jongens en een meisje geboren. Als Mattheis 13 is sterft zijn vader. Over de jeugd van Mattheis heb ik eerder een verhaal geschreven. In 1802 duikt Mattheis in Zaltbommel op, na zijn broers Willem, Johannes en Hendrik; het verhaal gaat dat hij soldaat is geweest, maar daar heb ik geen bewijzen voor gevonden. Hij krijgt omgang met een Rooms-katholiek meisje Johanna Jansen uit Horssen. Horssen is een dorp in het Land van Maas en Waal. De roepnaam van Johanna is Jenneke, een veel voorkomende naam later in de familie Groothoff. Jenneke is een dochter van Johannis Francen en Johanna Schalk. Soms krijgt Jenneke het patroniem Jansen (dochter van Jan) mee, soms de achternaam Francen. Baptizatus est Mathias filius naturalis Johannae Jansen. Susceptores Antonius et Maria Jansen. Supplevit Maria Herders. (Gedoopt Mathias een natuurlijk zoon van Johanna Jansen. Ondersteuners Antonius en Maria Jansen, vervangen door Maria Herders). Filius naturalis, een natuurlijke zoon, een omschrijving om aan te geven dat het geen wettelijk geboren kind is, een buitenechtelijk kind dus. Susceptores = ondersteuners, de peter en meter. Supplevit: blijkbaar was Maria Jansen verhinderd, zij werd vervanger (als doopgetuige) door Maria Herders. Intussen loopt Mattheis zich in Zaltbommel te verbijten. Hij wil graag trouwen met de moeder van zijn zoon. Misschien gaan ze beiden op bezoek bij dominee Kist, hij Hervormd en zij Rooms-Katholiek, dat was geen sinecure. Werd in die tijd de uitdrukking “twee geloven op één kussen, daar slaapt de duivel tussen” al gebruikt? 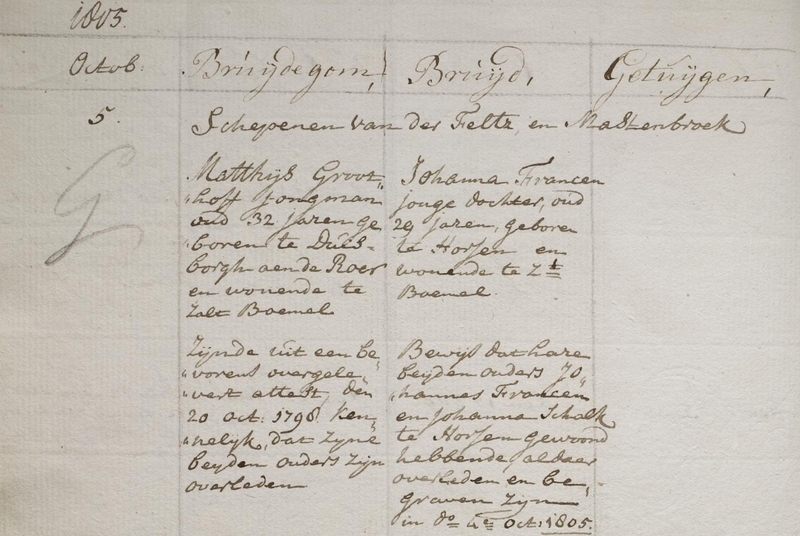 In ieder geval trouwt op 5 oktober 1805 het stel voor de wet: Mattheis Groothoff, jongeman, oud 32 jaren, geboren te Duisburgh aan de Roer en wonende te Zalt Boemel, en Johanna Francen, jonge dochter, oud 29 jaren, geboren te Horssen. De wederzijdse ouders zijn al overleden. Bij dit huwelijk wordt het kind Matthijs geëcht en krijgt als 2e naam Arnold; bij de volkstelling van 1810, l’Etat du population, staat hij zelfs als Arnoldus vermeld. Is dat zijn roepnaam? Op 3 november is de kerkelijke inzegening, waarbij een en ander nog eens benadrukt wordt. Ik weet niet of het toen en daar de gewoonte was om voorafgaande aan de inzegening schuld te belijden vanwege het voorechtelijke kind. Het bruidspaar moet wel beloven, hoewel het kind rooms-katholiek gedoopt is, het hervormd op te zullen voeden. Getrouwd in de kerke te Zalt Boemel den 3e November 1805. Volgens extract uit het register der getrouwde der kerke te Zt Boemel en dito 9 Nov. 1805 door den predikant J.G. Kist ondertekend houdende dit extract verder, dat het kind Matthijs Arnold Groothoff voor de voltrekking van ’t huwelijk geboren, en door het huwelijk van desselvs ouders geëcht en gemelde ouders tegelijk overeengekomen zijn gemelde hun kind, dat in de Roomsche kerk is gedoopt in den hervormden Godsdienst op te voeden; alhier vertoont en aangetekent op dito 9 Nov. 1805. Mattheis geeft op dat hij 32 jaar is, maar geboren in 1779 kan hij in 1805 pas 26 jaar zijn. Weet hij het niet of wil hij het niet weten? Hij is dus 3 jaar jonger i.p.v. 3 jaar ouder dan Jenneke. Dit leeftijdsverschil van zo’n drie jaar, waarbij de echtgenote ouder is, komt merkwaardig genoeg nog enkele malen voor in hun nageslacht. 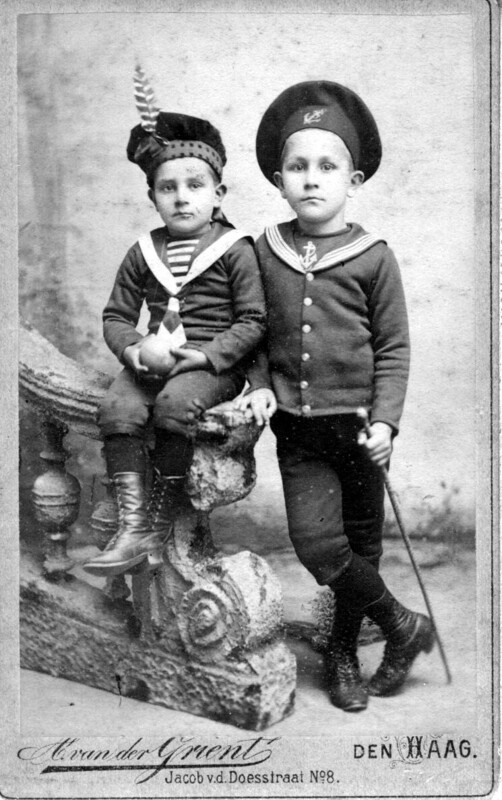 Bij kleinzoon Hendrik (1884), diens zoon Christiaan Hendrik Frederik (1913) en diens achterkleinzoon Christiaan Mattheis (!) in 2005, 200 jaar na stamvader Mattheis.